"History will never die, as long as there is a reenactor to keep it alive!" 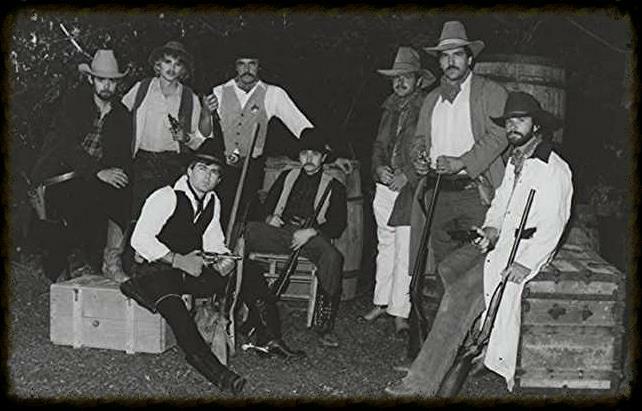 Also, in 1977, Rick and a Baptist Preacher by the name of Paul Conquest started an event called "Henry Pioneer Day" to reenact historical events that had occurred in his hometown of Henry, TN. 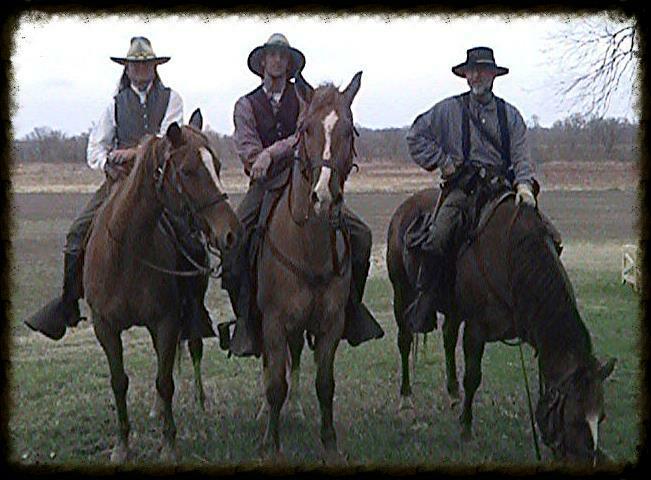 The Henry Gunfighters were formed during the first Pioneer Day and emerged to become a traveling troupe of reenactors. For over ten years, the Henry Gunfighters would reenact some the most famous bank robberies conducted by The James Gang. It was a natural fit considering, under alias names, Frank and Jesse James lived in Tennessee and conducted their "robbery" operations. As an Old West Gunfighter, Rick has been a reenactor for over thirty five years. After his Loretta Lynn days, Rick also was the Entertainment Manager for Mill Springs Theme Park in Paducah, KY and Six Gun City in Somerset, KY. At both theme parks, The Old West Gunfights were center stage of the entertainment lineup. Ten years after meeting Thomas Cartwright and hundreds of books later, Rick had developed not only a huge interest in history, but a vast knowledge of its happenings. 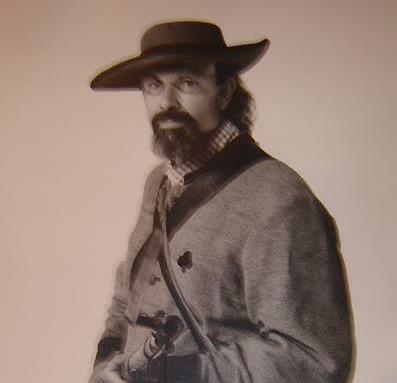 In the spring of 1999, he would decide to enter into the reenactment field full time as an entertainer, living historian, reenactor and sutler (merchant). Edutainment was born in the spring of 1999 and Rick Revel has been educating and entertaining ever since. 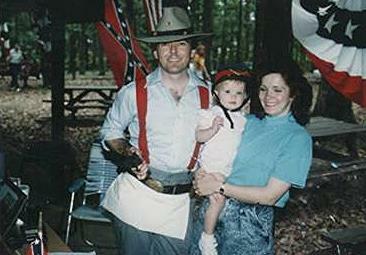 Also, in 1999, Rick joined up with the Third Tennessee Cavalry and became one of "Forrest's Men". In the early 2000's, he joined the 7th Tennessee Cavalry, which was the ancestral home unit of two Revel's that rode with General Forrest's Cavalry. During this same period of time, Rick also became involved with The Armies of Tennessee reenacting organization; first as a cavalry trooper, then as a battle announcer for the 140th and 145th Battles of Shiloh. The Tennessee State Museum is responsible for the other periods of history that Rick participates in as a reenactor. 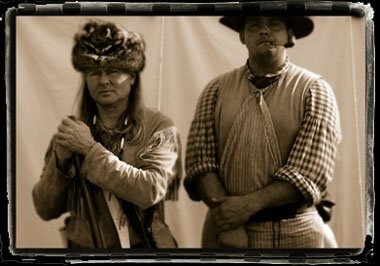 In 1998, Rick was invited to portray "Wild Bill" Hickok for the "Buffalo Bill's, Wild West Show" exhibit. This event lead to him being asked to perform as David Crockett at the State Museum for the area schools. The inspiration for his George Washington impression was also born during that same period of time. Once the impressions are developed and the research is over, Rick not only takes the characters to the stage, he carries them to the reenactments where the real "judges and jury" reside. It is at the reenactments where your reenactor peers, "jury" your impression, and if you fail, you are out. Rick has been "juried" by every period he participates in thus far and passed inspection, but there is always another challenge awaiting. He says, " No matter how good you feel about your impression, you can always improve it and you had better do so, for there's always another critic, just around the corner." Young Guns in the Old West! According to Ask.com, the word reenactor, entered the American English lexicon in the early 1980's. A reenactor by definition is a person who participates in the reenactment of historical events. Rick will be quick to disagree, that reenacting has been around, way before it entered into the contemporary vocabulary. Rick was first introduced to reenacting by Tom Destry, who's claimed a fame was being the original "Jolly Green Giant" in the early days of television commercials. 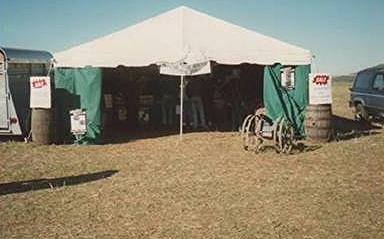 Tom was organizing "The Spirit of '76 Wild West Show" to travel along with The Bicentennial Wagon Train in 1976. He recruited Rick to not only sing during the show, but to also portray the young "Wild Bill" Hickok and to display some "Staged" trick shooting for the audience. 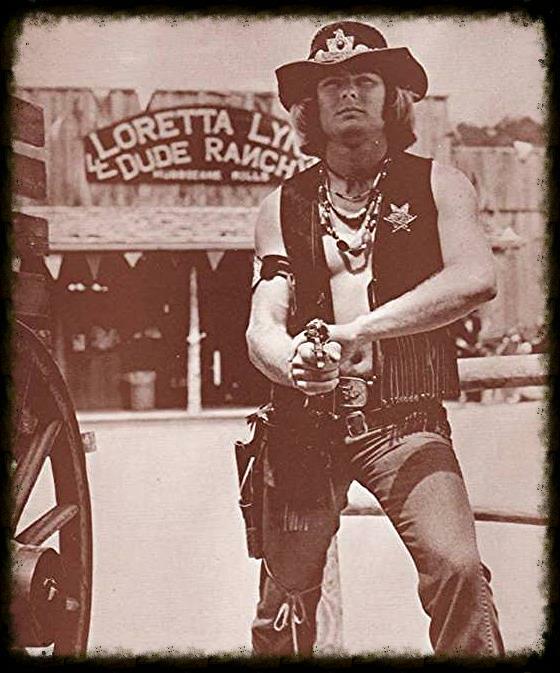 In 1977, while working as the Entertainment Manger for Loretta Lynn's Dude Ranch, Rick continued his portrayal of the young "Wild Bill" Hickok. For the next three years at Loretta's, Rick honed his skills on writing scripts for the skits and incorporating music into the action. The gunfights were complete with stunt work, like prate falls from roof tops and crashes through barrel barricades. There was not a stunt that he didn't try one time or the other during one of his gunfights. If he saw a "cool stunt" in a John Wayne movie, then he figured it could be done at a live event. 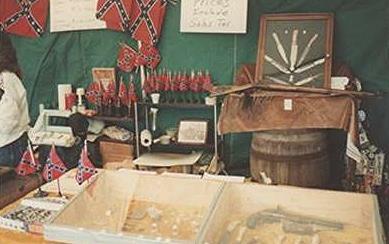 Rick was introduced to Civil War reenacting in 1976 while he was on the Bicentennial Wagon Train. Somewhere deep in the Shenandoah Valley, a new wagon joined "The Train" and it's driver was Jim Saylor. The wagon looked odd compared to most on "The Train", it was an original Civil War, CSA Ambulance and Jim was always dressed in his Confederate uniform. 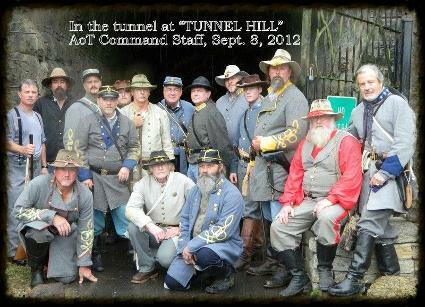 While traveling near New Market, VA in mid May, Jim grew very excited about a reenactment he was going to on the coming weekend. Jim was the most excited about the fact that the reenactment battle would take place on May 15th, exactly one hundred twelve years after the date it occurred. 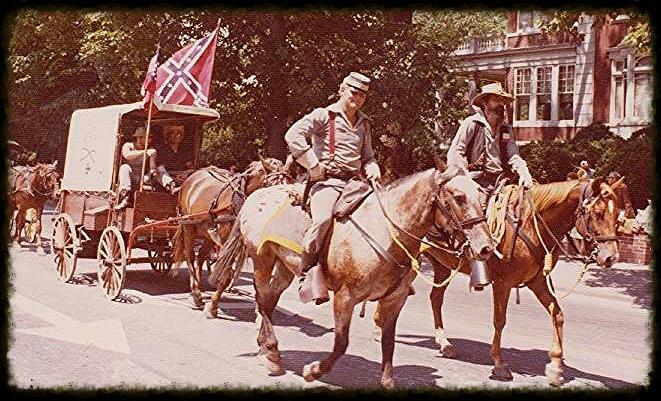 Jim invited Rick and a handful of others from "The Train" to join with the Confederate Cavalry for a day and we could say, "the rest was history". The Civil War reenacting bug bit Rick very hard that weekend and his love affair with "The War for Southern Independence" had begun. Other than an occasional march onto the field, Rick's main involvement with Civil War reenacting for the next few years was as an entertainer for the troops and spectators. Between his new marketing business, music career and raising a family, the calendar was pretty full. But, the yearning to heed the call of the bugle and to march to the drum and fife was too strong. 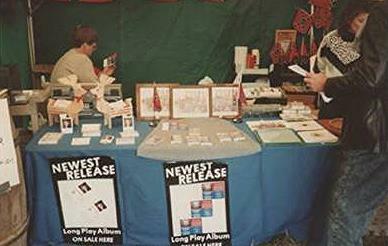 In 1989 he set up his first "sutlery" tent to sell his music and other wares. 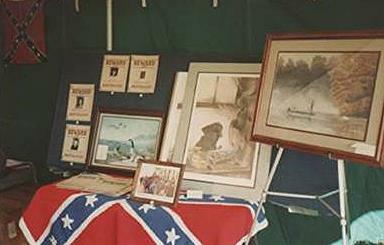 The event was the "125th Battle of Franklin,TN" and that is when his reenacting journey took a more serious turn. He made friends with Thomas Cartwright, who at the time, was the curator of The Carter House, where the Battle of Franklin took place in 1864. Thomas was not only a reenactor, he was a serious historian. So much so, he eventually became a regular guest on the History Channel. Thomas Cartwright's, well studied manner, had a lasting effect on Rick. From that day forward, he committed himself to emulate his new found friend. Rick had been taught by the best, that, "You must study to show yourself approved." After joining The Armies of Tennessee, Rick became friends with Tom Doss, the commander of the organization. Tom soon recruited Rick, in order to utilize his organizational skills for reenactment events. They collaborated on several events since 2002 and by the year 2009, Rick had Tom's total confidence. In December of 2009, Tom came to Rick in a time of need. Commander Doss was suffering from an injury he received when his horse fell on him during a reenactment battle. Tom had one surgery that was not a success and now faced a more drastic surgery that would leave him in bed for months. Tom installed Rick as the commander of The Armies of Tennessee with the brevet rank of Brigadier General, and he would be responsible for the overall command until Tom's return to duty. In a years time, Tom returned to his post and continued to rely on Rick to help build the ever expanding Armies of Tennessee. While maintaining his rank as Brigadier General, Rick was given the new assignment of Chief Executive Officer of The Armies of Tennessee.